There are three types of minor blues scales depending on whether they include the major third (3), the flat fifth (b5) or the major seventh (7). 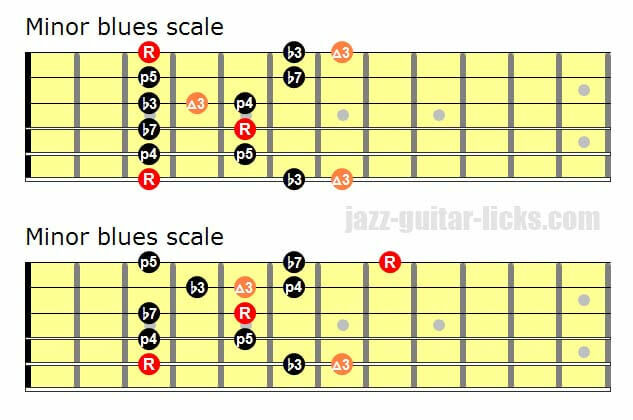 This is a very cool scale when you want to spice up the common minor pentatonic scale. Guitar students can get a lot of benefit out of learning these three scales. Adding a supplementary note to a pentatonic scale creates a hexatonic scale (a scale with six notes). The minor pentatonic scale with a major third is spelled : 1-b3-3-4-5-b7. Let's take the G minor pentatonic scale which is G-Bb-C-D-F. To get the G minor pentatonic scale you just have to add the major third (B), thus giving G-Bb-B-C-D-F.
Now, let's compare the three minor blues scale with the common minor pentatonic scale. The following jazz guitar lick show how the minor blues scale can be played over a dominant 7 chord. In that case we will be playing the G minor blues scale over G7.